The Grade II listed Welsh Chapel on Shaftesbury Avenue, originally designed by James Cubitt in 1888 and counting 1980’s super-club ‘The Limelight’ amongst its past tenants, would soon host an exciting multi-disciplinary dance show for 2 weeks called NEST. Dance, architecture, animation and interactive light technologies combine to create a tapestry of exploration and adventure. 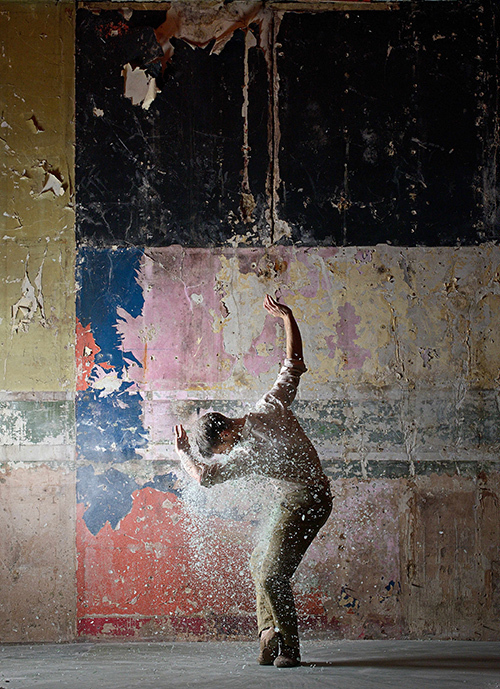 Becoming directly involved with a promenade dance performance the audience are free to weave their own experience, threads of movement, structure, and live music draw participants around the striking spaces and hidden corners of a disused former chapel. We have interviewed the producer & co-choreographer Malgorzata Dzierzon to learn more about the production. 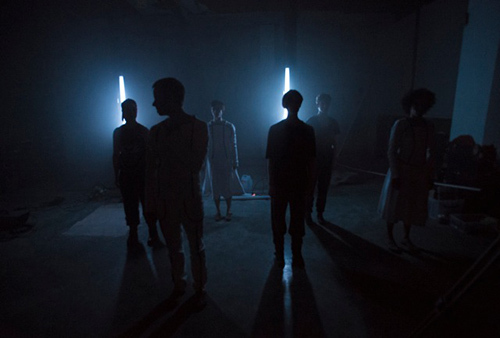 Q1: New Movement Collective is a group of dancers and choreographers. Could you tell us a bit more about how this idea of coming together started? A: New Movement Collective was formed in 2009 and currently consists of 11 members. Many of us have worked together at some point for Rambert , but our dancers/choreographers come from diverse backgrounds and have worked with Mathew Bourne’s New Adventures, Wayne McGregor/Random Dance Company and Manchester- based Company Chameleon among others. There were many choreographers emerging from within the group at the time, often dancing in each other’s work and we wanted to form a platform to showcase our choreography and continue the collaboration. As NMC we presented 2 separate evenings of choreography, curated by Clara Barbera in Spain, but found that the traditional platforms for dance, such as theatres were quite difficult or too expensive to access. During this time we started a partnership with AAIS (Architectural Association Interprofessional Studio) which is a post graduate course in performance and design with focus on collaboration, where we take turns to tutor a group of 5-6 students each year. This partnership added a new dimension to our work and created performance opportunities in unusual settings - a derelict building in Covent Garden, Matadoro Cultural Centre in Madrid, a post industrial building-turn gallery space in Cologne, Zaha Haidid-designed Roca Gallery in London. Last year we created our first independently produced full length work, commissioned by Will Alsop for Testbed 1, a 650 sq meters ex-diary space in Battersea. Casting Traces was based on Paul Auster's New York Trilogy and performed within a giant architect-designed paper labyrinth. Following the opening performance we were approached by Stone Nest (former Welsh Chapel) and invited to visit and pitch a production proposal for their building in Shaftesbury Avenue. After a few weeks and several brain storming meetings with a group of invited collaborators we came up with a performance and design concept for NEST, based on Homer's Odyssey. A: The venue had an immediate appeal to us, not just because of its central location but also its lay out - visiting the rooms of the former Chapel takes you on a real journey. We wanted to create a performance which gives the public a sense of freedom to explore, yet has enough structure for them to follow. The Chapel has gradually revealed itself to us, it has now been stripped down from the remains of the night club/bar era, and the original features became a lot more visible. We wanted to celebrate the building in its glory, so our designs needed to be sensitive and respond to the surroundings, unlike in a theatre, where you can create a new world with the scenery for every act, without e consideration of the building's style or history. We put a funding application in before Christmas and while we had been able to start the artistic planning with collaborators beforehand, it would be had been difficult to recruit a crew and technical manager without offering a guarantee of pay and you really need that expertise and man power as early as possible in a venue where all equipment needs to be brought in for the performance. The facilities are being improved for the opening and we are now working with a small technical team, but it is a huge job to provide power and transform the rooms in order to create the desired experience for the public. Q3: What are the differences between a project in the traditional performance venue and one in an alternative venue like this? A: Every building is different, unlike with a more traditional performance you can't just turn up with a show and expect to re-created it as is. Each building will have its own technical and access challenges, for the performers and public alike. The venues we have worked with offer the use of the building and give us a lot of artistic freedom, which is absolutely amazing, but unlike theatres they don't have departments dedicated to fund-raising, marketing or technical support of the production, so that's our sole responsibility - in addition to choreographing and performing the work. Nest Trailer 2 from new movement on Vimeo. Q4: There are a lot of collaborators from other creative areas involved in the production. How do you feel about the process and how would the production began to take shape with all the various inputs from different directions? A: We have gathered a team of architects, lighting technology artists, costume designer and composer quite early on. They were all invited to pitch and discuss the ideas together, but their sides of production are being delivered across a staggered time line. It was important for us to have the main set component early, in order to respond and choreograph with it, so the structure designed by architects from Studio Weave was finished a month before the opening. The music composition was delivered around the same time, but with the input from MLF (interactive lighting technologies), Chris and Anna ( the composers) continued to tweak it until a few days last week. We needed the costumes to be delivered quite early in order to generate some production images for marketing and test how the proposed reflective material "behaves" in the light. All departments are invited to feedback, so it was good to allow this time to accommodate any specific requests. 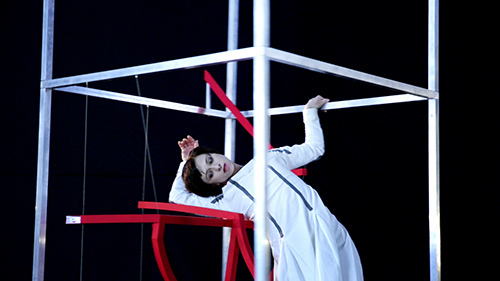 The choreography was developed in a series of research periods and then shared online, as we often work from remote locations in the early stages of the production. This method has its challenges but also gives perspective and allows more time for reflection. However, it feels good to have everyone working in the same space in the final weeks leading up to the opening - it makes for a lot more enjoyable and productive process. Nest Trailer 1 from new movement on Vimeo. Q5: We understand that the work is site specific. However it is only running for under 2 weeks. Are there any plans for re-runs or tour? A: We are a young organisation, so we are taking it step by step. We have nearly tripled the amount of performances in comparison to last year's production. We want to continue to offer an intimate, unique viewing experience for the audiences, which means we need to limit the amount of tickets sold per show. We have nearly 30-strong team of artists and crew working each night, which makes for a rather expensive production. In addition, our members have ongoing commitments to their individual projects and employers, such as Rambert which need to be accounted for. We are travelling to Denmark this August to re-create Casting Traces at Carlsberg's former brewery site, and we hope to be able to perform NEST in the future as well. The building is due for re-developemnt, so we will have to see what happens - it is a matter of finding the right space and enough money to bring everyone together again!